Most people think of their family tree as a kind of chart that depicts relationships between family members. 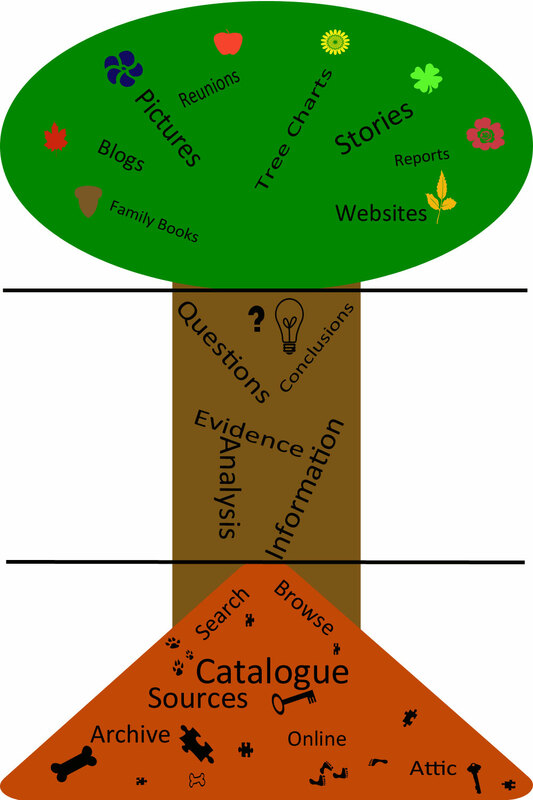 Using a tree diagram to represent knowledge is common to many disciplines and has been around for a long time, as the New Scientist article Why do we love to organise knowledge into trees points out. Family tree diagrams are most useful as visual representation of a limited set of conclusions. Used as a bare bones summary, they are highly effective. If the diagram does not fit on an A3 sized (roughly 42cm x 29 cm) piece of paper, the message has probably been lost. The branching hierarchy breaks down once lines start crossing, often within just a few generations. Genealogical research extends a long way beyond a subset of conclusions, and relationships are a lot more complicated than a branching hierarchy. So is the all pervasive tree metaphor useful? As real trees don’t look much like the branching diagrams either, I wonder if the metaphor can be repurposed. Think of your family tree as your personal understanding of your family history, genealogy and connected micro-histories: a personal Tree of Knowledge. A common definition of a tree is a plant with a woody stem or trunk. 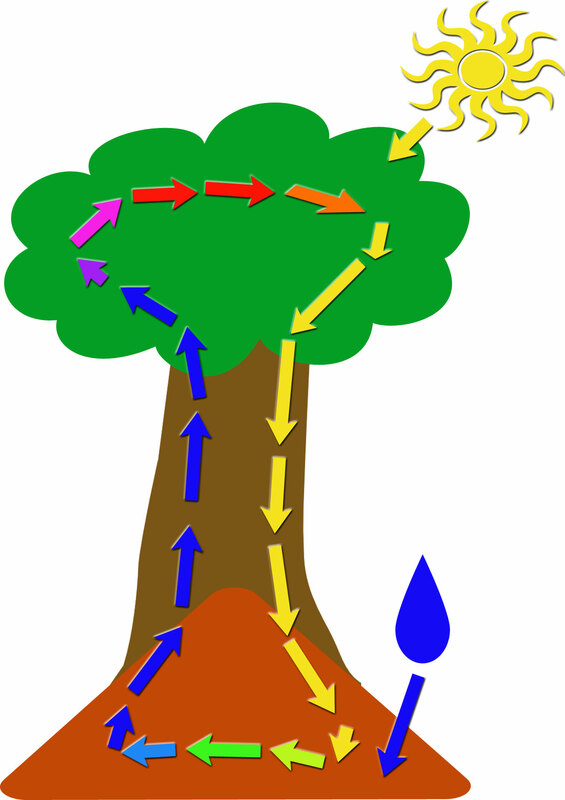 Real trees also have roots, and canopies that grow leaves, flowers and fruits. 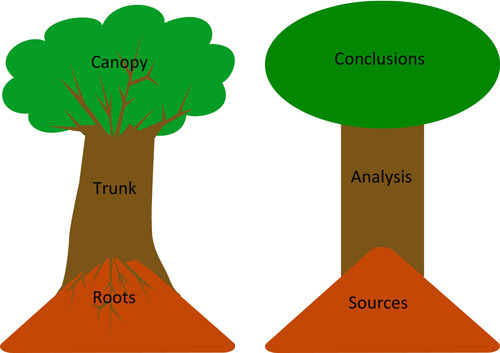 Think of the roots as sources of information, the trunk as processes of analysis and the canopy as the conclusions you draw from your research. The roots of your tree seek out the documents, artefacts, memories and other sources of relevant information using search and browse tools, catalogues to find and access the archives, online repositories and family members hoards. The trunk of your tree is where the hard graft occurs. Information is evaluated for reliability and accuracy. Many pieces of information are combined to test theories. Evidence points toward tentative and firm conclusions. The canopy of your tree is the part that others typically see. The products of you work such as family tree charts, stories and the many other ways you communicate your findings are available to others. A high quality product of your work may a seed and guide other researchers to grow their own family tree. Family history research is iterative. Your tree is fed by both new sources and in interactions with fellow researchers, much as a real tree needs both water and mineral nutrients from the soil and sunlight. Tentative conclusions and other researchers point to new avenues of investigation. New information changes our conclusions. Interactions between ideas and information grow a broad tree trunk. A healthy family tree has a sturdy trunk. Growing you own tree of family history knowledge is far more rewarding than picking parts of some-one else’s canopy. It takes time and effort to nurture your understanding. That does not mean that you should not collaborate with other researchers. Good collaboration is about helping one another tend our trees. I aspire to grow a magnificent oak. The form of your tree will be different to mine even if we are closely related. Size does not determine the health of your family tree. A healthy family tree, even a tiny seedling or young sapling is a thing of beauty. Take a closer look at yours.